LUPRON DEPOT-PED has more than 23 years experience navigating the CPP reimbursement landscape to provide you with streamlined support. 1-855-LUPRON-P (1-855-587-7667) to help with any questions you may have. Even if your patients switch between the LUPRON DEPOT-PED 1-month and 3-month formulations, they will stay in the same support program they are already using, including access and reimbursement support. With the Instant Savings Card, your patients can save up to $250 (up to $3,000/year) on 1-month dosing and up to $1,000 (up to $4,000/year) on 3-month dosing for each prescription after a $10 co-pay expense. Pharmacy Benefit: Your patients can use their Instant Savings Card at the pharmacy at the time of purchase and have it applied to their co-pay and/or deductible. *Eligibility: Available to patients with commercial prescription insurance coverage for LUPRON DEPOT-PED who meet eligibility criteria. Co-pay assistance program is not available to patients receiving prescription reimbursement under any federal, state or government-funded insurance programs (for example, Medicare (including Part D), Medicare Advantage, Medigap, Medicaid, TRICARE, Department of Defense or Veteran’s Affairs programs) or where prohibited by law or by the patient’s health insurance provider. If at any time the patient begins receiving prescription drug coverage under any such federal, state or government-funded healthcare program, patient will no longer be able to use the LUPRON DEPOT-PED Instant Savings Card and patient must call 1-877-832-9755 to stop participation. Patients residing in or receiving treatment in certain states may not be eligible. Patients may not seek reimbursement for value received from the Instant Savings Card from any third-party payers. Offer subject to change or discontinuance without notice. Restrictions, including monthly maximums, may apply. This is not health insurance. Parents and caregivers of children on LUPRON DEPOT-PED can speak to a certified registered nurse about diagnosis, treatment, co-pay issues, and more, at no cost. 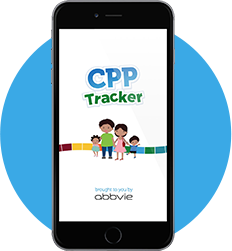 The CPP Tracker is a smartphone app, which is available at no additional cost, that helps parents and caregivers manage their child’s journey during treatment for CPP. The CPP Tracker makes it simple for parents and caregivers to keep up to date with their physician appointments and track their child’s progress anywhere they go. 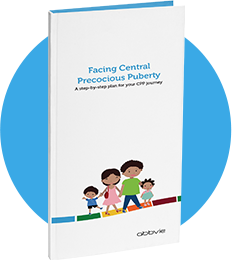 Your CPP caregivers and patients have access to a brochure designed especially for them: Facing Central Precocious Puberty: A step-by-step plan for your CPP journey.